"Catch Ya Later Donna Hay", our theme for this week at I Heart Cooking Clubs (IHCC). This is the final week that we'll be cooking with Donna Hay, and will be starting with our next featured chef, Nigel Slater in April. But not to fret, there's Potluck week each month, and we are free to cook with any of our previous featured chefs' recipes, so I'll be seeing Donna Hay again. I made this Crispy Sage Potatoes with Fried Eggs for myself for brunch. This is really easy, and quick to make, a perfect meal for one. Recipe uses Sebago potatoes, but I have used 2 medium Russet, since that was what I had. The potatoes are peeled and cut to small cubes, pan-fried in a little oil until half cooked with some coarse chilli flakes, salt and pepper, then the sage leaves are added in, cook for a few minutes more until the potatoes are tender and golden. The potatoes are then pushed to the sides, creating a space in the middle, break an egg into it, and cook until the egg is set and yolk still runny. Serve! See, how simple it is! A perfect meal for one! Since I skipped my breakfast, I had this for brunch with a mug of warm tea. Satisfaction! I like my yolks runny! Cook it a little longer if you like the eggs to be fully set. Heat the oil in a large non-stick frying pan over medium heat. Add the potatoes, chilli, salt and pepper and cook for 4-5 minutes. Add the sage and cook for a further 4-5 minutes or until potatoes are tender and golden. Move the potatoes to the sides and crack the eggs into the middle. Cook for 3-4 minutes or until the eggs are just set. Drizzle with Worcestershire sauce to serve. Serves 2. This post is linked to I Heart Cooking Clubs (IHCC), for this week's theme "Catch Ya Later Donna Hay". 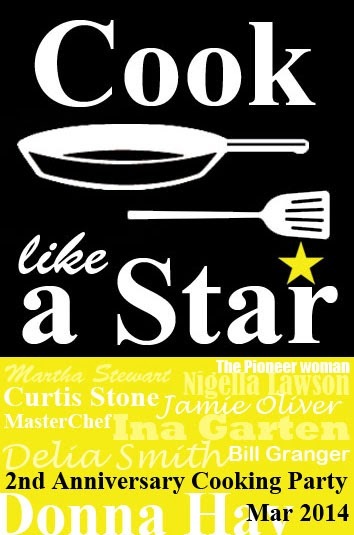 We will be cooking with a new featured chef, Nigel Slater, starting next week. If you are interested to join us, do find out more details at IHCC, here. This wold be great for any meal! I like the egg with runny yolk too! Oh, I love this simple yet delicious dish. I always have a packet of potatoes at home. And eggs are also my favourite, I can eat a big bowl of rice with this dish! Yum, I could not possibly think of a more perfect breakfast/brunch. I love the flavour of sage with potatoes, and a lovely runny-yolk fried egg in the middle turns this into a heavenly plateful. Like you, I'm looking forward to a new cooking adventure with Nigel Slater, though Donna will still continue to be a regular chef in my kitchen. Great for breakfast, brunch, lunch, or dinner, I think! Potatoes and sage go so well together. Love your collage of Donna Hay dishes! The addition of sage really makes dishes flavorful and special. Love this potato and egg dish! I am with you on the runny egg. ;-) I love everything about this dish--sage is one of my very favorite herbs and so fabulous with the potato and eggs--a satisfying meal any time of day! I will continue to cook with Donna too but it's fun to change to Nigel Slater--he has some great recipes and excellent comfort food dishes. What a great dish. I love potatoes with sage and a runny egg just makes them better. 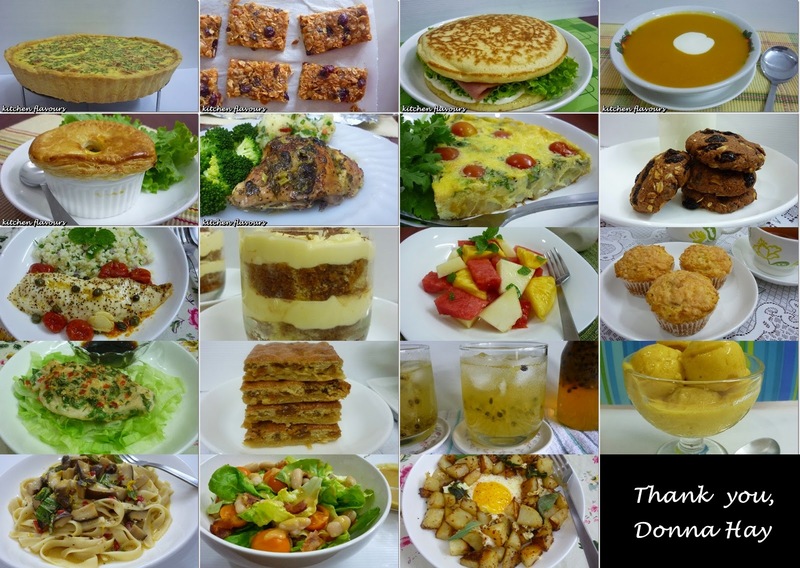 It's wonderful to see the photos of all the Donna Hay dishes you made together in a collage. Perfect brunch dish for us! Easy and comfy for a Sunday morning! You've made some gorgeous dishes during this Donna Hay tribute! Kudos! You cannot beat potatoes and a nice runny egg. They are the perfect, comforting combo. Have to make this one.